COLUMBUS — Cooler weather returned for the weekend, but did not seem to slow anyone down at the Ohio Beef Expo, held March 18-20. The Expo, now in its 29th year, drew shoulder-to-shoulder crowds to the Ohio state fairgrounds for the trade show and breed auctions — and more beef cattle than some of the barns were set up to hold. Nearly 600 youth participated in the quality assurance program March 19, which trains them on a variety of animal care practices, and more than 700 cattle were shown in the junior show, March 20. The cooler temperature made for “good cattle weather,” according to one exhibitor, because it helped keep them calm. However, the snow and blowing drizzle made for some chilly moments in the make-up area, and when the cattle were being washed. 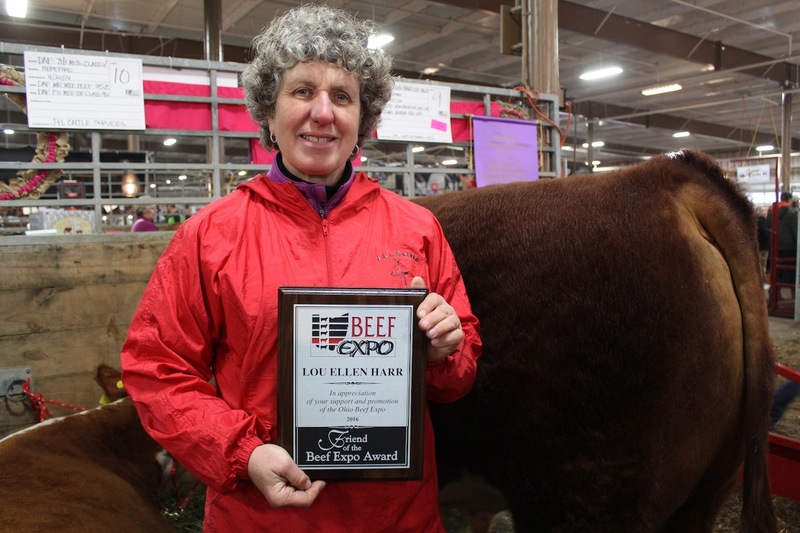 The Expo Planning Committee presented “Friends of the Expo” awards to Lou Ellen Harr, a Hereford producer and cattle fitter from Jeromesville; M.H. Eby, a long-time Expo vendor of livestock trailers; and Bill Sexton, of Washington Court House, who manages a cow-calf operation and is currently the regional vice president for the National Cattlemen’s Beef Association. Harr has attended the Expo since 1989, and has spent her life working with beef cattle, first in Missouri and more recently in Ashland County. She and her husband, Jeff, have their own Hereford operation, J & L Cattle Services, and also do custom fitting at the Expo. Lou Ellen said the growth at the Expo has been “phenomenal,” and that it’s become a great place to unite the industry. Kirk Swensen, regional sales manager for Eby, said his company appreciates being named a friend of the Expo. M.H. Eby is a third-generation, family-owned business that started in 1938. The company has sponsored past Expo events, and interacts with livestock owners at the Expo through its trade show. Exhibitors wash cattle at the Ohio Beef Expo. Sexton, in addition to his own beef operation, has helped with the Expo for more than 16 years, including serving as vice chairman form 2011-2015. He said the Expo is successful because of the volunteers, and their effort to make it one of the biggest and best. Elizabeth Harsh, executive director of the Ohio Cattlemen’s Association and Ohio Beef Council, said volunteers have to get good at taking the compliments — with the complaints — and making sure ends meet. “We appreciate everything they do to make the Ohio Beef Expo the success that it is,” she said. Each year, the Ohio Cattlemen’s Association also chooses student interns to help with operations, which helps give younger cattlemen leadership experience. This year’s spring interns, Abby Mayer and Jenna Phelps, were busy answering questions, making sure people and exhibits were in the right place, and helping promote the event. Mayer, the OCA public relations intern and a student at Capital University, helped make updates to the Expo website, monitor the social media and take pictures. Phelps, a student at Ohio State University, served as industry relations intern, and worked with trade show exhibitors, helping to finalize their contracts and find their place in the trade show building. On March 19, some 575 youth participated in Beef Quality Assurance training, which covered the various aspects of beef cattle care and stewardship for all ages of junior beef exhibitors. The quality assurance class is a requirement for participating in the OCA BEST program, and also county shows. Jeff Fisher, OSU Extension ag educator in Pike County, talked about the importance of good environmental stewardship, which means considering the beef animal’s impact on water, air and land — and making sure facilities and wash areas comply with good water management, and are environmentally sound. He said youth exhibitors also need to be good neighbors in their industry — not only to their next-door neighbors, but to those who may not understand beef cattle production.